I'm trying to overlay a QuickTime? movie that consists of PNG images on top of another movie. I have noticed that FFMPEG doesn't seem to handle such an image-only movie correctly. To illustrate the problem I have made a simple example movie that has one image sample for each second with a timecode written to it. When I try to convert this movie and change the framerate FFMPEG seems misinterpret samples randomly. You will see that FFMPEG will shorten the first sample to 1 frame instead of 25? The sample that should appear on frame 26 will instead appear on frame 2? Looking forward to some help with this problem! timecodes.mov​ (426.6 KB) - added by cehoyos 8 years ago. Please add complete, uncut output of your call to ffmpeg. I'm really looking forward to a solution to this problem. Do you need some more sample movies? Just let me know if there's anything I can do to help. BTW, Thx for your quick reply and handling of this matter! I had an older version of FFMPEG pulled from my backup where I remember that this was working. Maybe you could compare the code from the subversion repository to easier find the problem. If you believe this is a regression, please find the version introducing it with git bisect. But the FFMPEG version I have working is from the SVN repository back somewhere in november 2010. Will I still be able to find that in the GIT repository? I found the revision intruducing the bug using git bisect as you suggested. It seems like something changed in the mov and mp4 muxer. How do we continue to solve this bug? Now I have compiled a version that can encode the movie correctly by enabling the AVFMT_VARIABLE_FPS flags for the mov and mp4 muxers. 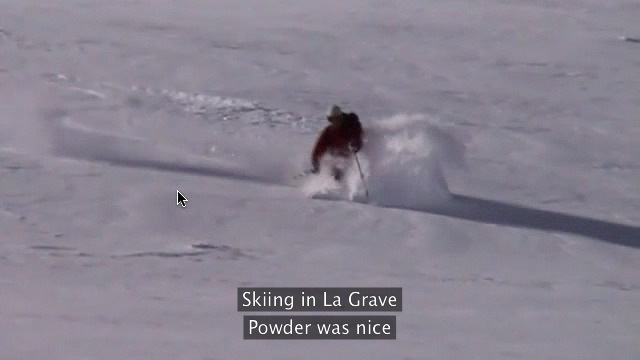 it still skips the empty samples at the beginning of the skiing_subtitles.mov file and everything gets out of sync. Thanks for adding the sample movie back again cehoyos. I accidentally removed it from my dropbox. michael, just let me know if you need any further samples or anything to solve this bug. It now works when changing the frame rate for a single file like in the example at the top above. But when I try to use the movie overlay filter it still doesn't work. The empty samples at the beginning aren't handled correctly. I will file a new bug for the movie overlay filter. Hopefully it's easy to fix now that you found out what was wrong for the single file case.